At the end of 2012 - just before the emergence of H7N9 in Eastern China (which was to be quickly followed by bevy of new bird flu viruses) - Highly Pathogenic Avian Influenza was in a steep decline around the world. 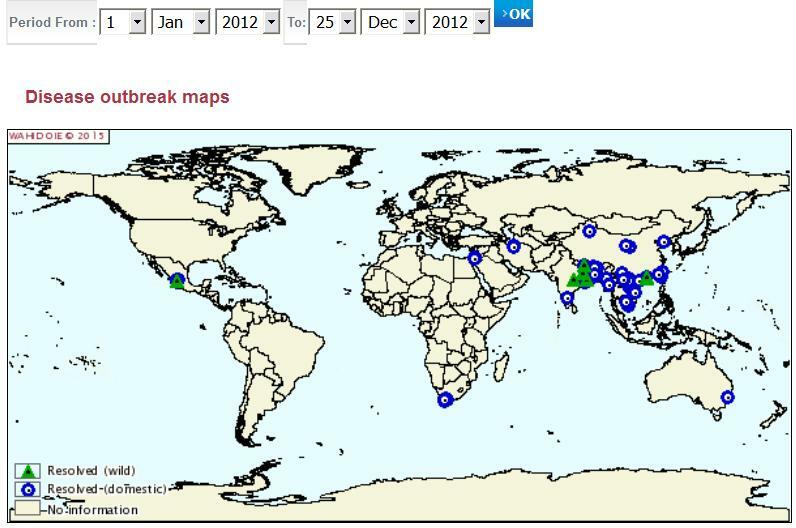 The only HPAI player of real consequence was H5N1, and after its great expansion in 2006-2007, it had slowly contracted so that it was really only a threat in a hand full of countries; primarily Egypt, China, Vietnam, Indonesia, and Vietnam. The number of human infections with H5N1 was half that of the previous year (only 32), which happened to be the fewest recorded in nearly a decade. 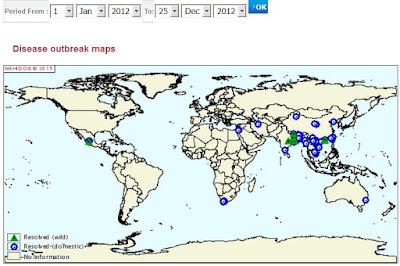 H5N1 had retreated from Western Europe, and Western Africa, and was even showing signs of slowing in hot spot countries like Indonesia, Bangladesh, and India. But that was then, and the bird flu world is a far different place today. 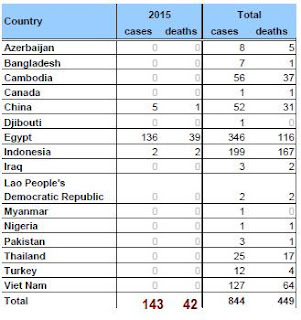 For starters, 2015 saw a record number of human H5N1 infections reported (mostly out of Egypt), which represents more than a 4-fold increase over 2012's total. To that you can add a couple of hundred H7N9 cases, and a handful of scattered H5N6 and H9N2 infections. 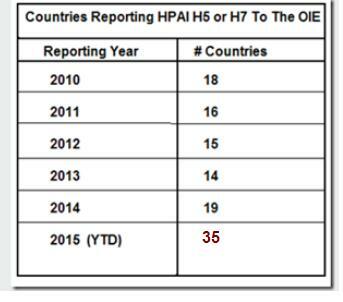 Below you'll find maps comparing HPAI reports to the OIE between Jan 1st – Dec 25th 2012 vs. the same time period in 2015. The following maps were generated by the OIE’s WAHID Mapping tool, depicting Highly Pathogenic AI in birds (no human cases are mapped). A remarkable increase, particularly when you consider HPAI H5 finally made it to the Americas, sparking the worst epizootic in North American history with more than 50 million birds infected or destroyed during the spring. Another way to look at this surge in avian flu around the world is by comparing the number of countries that have reported outbreaks this year, versus previous years. Since 2012, that number has more than doubled. The contrast between 2012 and 2015 grows even greater when you consider the sheer number of new subtypes - and variants of existing subtypes - that have emerged over the past three years. 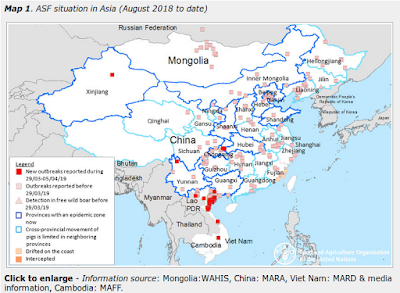 H7N9 along with HPAI H5N8, H5N2, H5N3, H5N6, H5N9 and H10N8 are all recent arrivals, and over the past year H5N8 alone has spawned multiple reassortant HPAI H5 viruses in both North America and Taiwan. Europe has seen a remarkable number of new HPAI H5 and H7 viruses emerge over the past 6 months, with France, Germany and the UK all reporting LPAI to HPAI mutations. Exactly what is driving this global expansion in avian flu diversity isn't at all certain, but the trend is hard to dismiss. In 2008, after making huge advances, H5N1 began a slow, and unexpected decline. So the future expansion of any of these new subtypes is far from assured. That said, we have far more diversity today in the avian flu world than we've ever seen before, and that probably favors the virus's success. Fortunately, most of these new viruses currently appear to pose little or no threat to human health, but since viruses constantly evolve, one can never say `never'. They do, however, represent a major threat to poultry producers, the food supply, and the economy, and are potential evolutionary stepping stones to more dangerous viruses. In the meantime, H5N1, H5N6, and H7N9 do have a limited ability to infect - and sometimes kill - humans, and all three appear to be thriving in various regions around the globe. After ten years of blogging, I know better than to offer predictions about what any specific flu virus will, or won't do. But between this expanding array of avian flu subtypes, MERS-CoV, Zika, Antibiotic resistance, Dengue, Ebola, and whatever else nature's lab cooks up, 2016 has the makings for a very busy year on the infectious disease front.